Selina is calling you! Enjoy discovering the best place to surf in Costa Rica with Selina. On this surf camp, you will explore the incredible beach of Santa Teresa and meet people from all over the world. For those who are looking for a purpose-filled vacation enriched with experiences can join this sustainability and social responsibility activities. Enjoy the excellent surfing experience in Santa Teresa as you hit the waves! Selina Santa Teresa, the biggest hostel on the main road, is a 4-story playground that totally vibes with the town’s artistic environment and culture. With a bed and a room for all tastes, Selina has an electric social atmosphere and soon-to-be lifelong friends awaiting your arrival. Selina Santa Teresa has good and amazing vibes and atmosphere and very familiar and dedicated service. This accommodation includes three different double rooms with en-suite bathroom, one private quadruple room with en-suite bathroom, and shared rooms with shared bathrooms. All of them are non-smoker rooms. Free Wi-Fi is also available. Selina teaches surfers of all levels. They provide surf lessons for those who want to learn how to step on to the water and surfers that want to improve having more speed and control in the green waves. The surf lessons are also for advanced surfers who want to go one step further in their technique and style. Professional and experienced surf teachers will coach you. They will get you to that next level and help you get the most from your surfing. Selina uses the latest and most advanced equipment to provide the best feeling ever. All the lessons include surfboard and all equipment needed. The material in surf lessons includes huge quiver all sizes (soft-boards, fiberglass-boards, epoxy-boards, and high-performance boards). The boards are for beginners, intermediate, and advanced surfers. There will also be free surf time with equipment outside course hours. Selina Santa Teresa is the best surf location in the area of Santa Teresa, directly at the beach in the surf spot. Santa Teresa is a remote beach town in Costa Rica that seems to have a little something more, a secret power if you like. It's an energy that can’t be explained but can definitely be felt by all. The long white sand beaches, the endless barrels, the music, the parties, the mind-bending culinary experience and the beautiful people that walk the streets will bring you to Santa Teresa, but it's that magnetizing energy that makes you never want to leave. Please book your flight to arrive at Juan Santamaria International Airport (SJO). Transfer from/to the airport is available upon request. Alternatively, you can also book your flight to Daniel Oduber Quirós International Airport (LIR) which is 2.5 hours from Selina. There is a direct bus from San Jose to Santa Teresa and the bus stops in front of the property. Life is better when you surf! 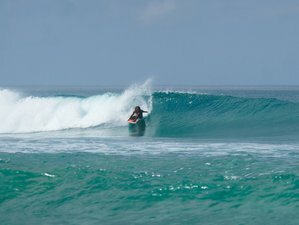 Selina Surf Club offers you the best surf camp experiences in amazing accommodations and perfect shared space offices. During holidays, bank holidays and special events, cancellations / modifications are free of charge up to 15 days prior your arrival. After that, Selina will charge your credit card with 100% of the surf camp. Cancellations / modifications are free of charge prior to 7 days before your check-in date for the rest of the year. After that, the surf package will be non-refundable and you will be charged with 100% of the surf package. In case of no-show, 100% of the surf package will be charged to your credit card. Selina reserves the right and you hereby authorize them to charge your credit or debit card for any damage incurred to your room or the hotel during your stay (including without limitation specialist cleaning) or for any items that are missing when you leave. Same applies for the surf equipment. Different cancellation / modification policies apply for groups.